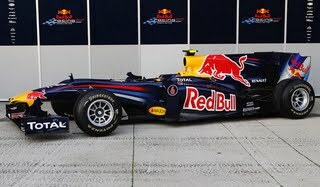 Today prior to the beginning of the second round of F1 Pre-season testing, Red Bull Racing finally unveiled its 2010 Challenger, the RB6, becoming the final existing Constructor to join the party. The RB6 like the Force India VJM003 is an evolution of last year’s chassis; albeit the RB5 had much better results then the latter’s VJM002. Mark Webber will have the honours of driving the new car first, getting the first two days of this week’s test session before ‘ZEBB, a.k.a. Sebastian Vettel gets behind the wheel Friday-Saturday.